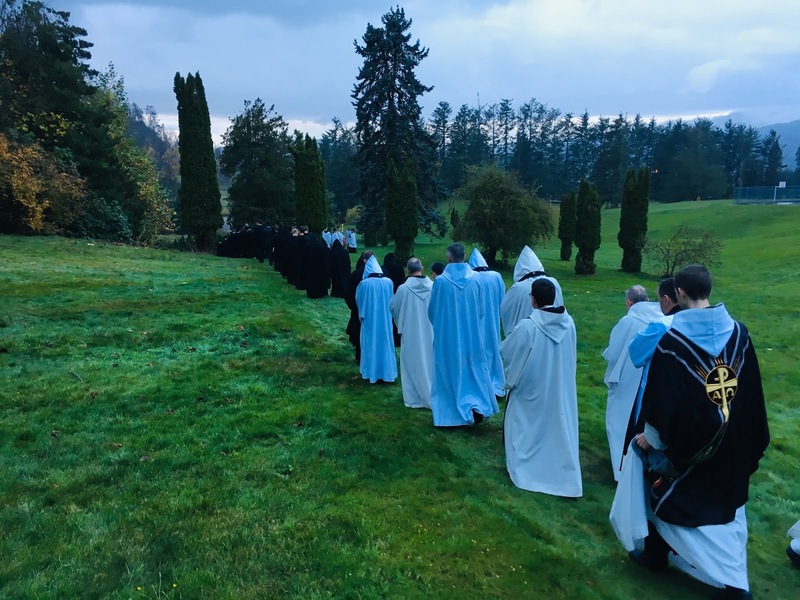 On All Souls Day I was privileged to attend the Conventual Mass at Westminster Abbey in British Columbia, Canada. After Mass the monks and students processed to the monastery cemetery to pray for the deceased members of the community. The prayers included the De Profundis. The impressive monastic rite at the graveside was moving and consoling. I have always said the Church in her goodness and wisdom shows us the utmost sympathy for the human condition, evidenced through her rich liturgical life. The human element will always be present among us while in her mercy and graciousness Mother Church offers us the most human of liturgies, following the seasons and giving us the opportunity to both grieve and rejoice. This is especially lived out in the cycles of monastic liturgy and seen clearly in the three Requiem Masses of All Souls Day. The liturgical life in monasteries plays a crucial role in the life of the Church. It can be observed that the development of monasticism corresponds very closely with the development of Christian culture. What Hellenism was to the ancient world, Christendom is to the modern, having been born from and formed by the monasteries and their liturgies. Despite manifold failures, the one institution that has had a greater and more direct influence on the formation of Christian culture more than any other single factor is the monastic order with its liturgy. It is in monasticism that the Christian religion and Christian culture attain their most complete fusion. The monastic rule is sacred law that is applied to every detail of individual life and becomes the basis of a common way of life and a common society in the pursuit of Christian perfection. The liturgies in monasteries are the center of a rich tradition of religious poetry, music and artistic symbolism. The art of Christendom in both its Byzantine and medieval phases was essentially a liturgical art which cannot be understood without some knowledge of monastic liturgy itself and its historical origin and development. As the world enters a new phase of "dark ages" as evidenced by the collapse and implosion of family life, schools and government institutions, we are seeing very clearly an interesting phenomena. Fifty years after the liturgical "renewal" that promised the modern world untold success in all areas of evangelization, we can see very clearly that healthy (= flourishing) monasteries that attract vocations are continuing to gravitate to their original mandate, preserving and fostering classical culture in all its forms, with sung Mass in the Roman Rite - in Latin - as the norm. The liturgical edifice in monastery liturgies has always been at the same time the organ of both the higher and lower culture and consequently a great instrument of social integration. In other words, the temple informs the city. On the one hand in the monastic temple is the liturgy celebrated by the monks in the common language of educated Christendom (Latin), and on the other, locals from the neighboring village and lay visitors come to worship in the monastery chapel making the monastic liturgy the center of the common people, with the liturgy acting as a teacher, school, theater and picture gallery. Monasteries have long been beacons of light and learning, helping to preserve the highest standards of culture and foster education in both sacred and profane knowledge (and the best of sacred music). A refuge of divine and human knowledge, especially during dark times. May the monasteries continue to shine and lead in the manner of our ancestors, teaching us through their superior distinctions the high art of sacred liturgy, in song and text. "I wonder how far I shall carry any opinion with me when I plead for active effort to revive the general use of Latin? It has always seemed to me one of those necessary reactions without which we shall be unable to re-establish the unity of Christendom. The longer we defer making the effort the harder the effort will become; yet it is hardly more than 200 years since Latin was still the common medium of understanding on serious matters among Europeans, and not 300 years since it was the necessary medium for discussion on subjects common to all nations."